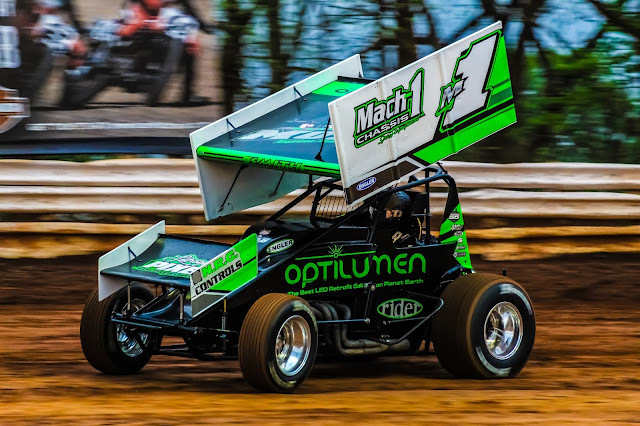 SELINSGROVE, Pa. – Mark Smith of Sunbury out-raced a strong field of 360 sprint cars to claim his fourth out of five Kramer Cups at Selinsgrove Speedway Saturday night in the 30-lap tribute race in memory of former champion and Hall of Fame Driver Kramer Williamson. The $2,573 victory was Smith’s first of the year and 23rd career in 358-360 sprint car competition at Selinsgrove Speedway at the wheel of the Mach 1 Chassis M1. Smith also won the Ray Tilley Classic for 410 sprint cars at the track in April. Bryan Bernheisel of Lebanon won the May 5 makeup 20-lap limited late model feature, while George Dixon Jr. of Hesston took the checkers in the regularly scheduled feature. Shaun Lawton of Bloomsburg scored his first win of the season after an exciting side-by-side race with Kyle Bachman of Selinsgrove in the 15-lap pro stock race. Bob Bussey of Northumberland also notched his first win of the year by inches in a three-wide finish in the 12-lap roadrunner feature. Selinsgrove Speedway will be back in action at 7 p.m. Saturday, June 9, with Stock Car Saturday Night sponsored by Jeff’s Auto Body & Recycling Center featuring the first-ever appearance by the Northeast Ultimate Super Late Model Series in the 30-lap Showdown on Sand Hill paying $3,000 to win. Another sanctioning group that will be making its first stop at Selinsgrove June 9 will be the Mason Dixon Limited Late Model Series in a $1,000-to-win 20-lap race. The pro stocks and roadrunners will round out the program. JJ Grasso started on the front row at the wheel of a KramerKraft sprint car and powered into the early lead in the Kramer Cup race after a brief duel with polesitter Chad Layton. On the second circuit third-place starter Mark Smith began to apply heavy pressure to the leaders. The race was slowed on lap three when Michael Walter’s car rolled to a stop in turn four. When the race resumed, Grasso set a torrid pace as Smith advanced to second and Layton held down third. By lap eight, the leaders began to encounter slower traffic and Smith moved into striking distance. In turn four, Smith pulled a slider on Grasso to take command of the field. On the 10th circuit, Layton drove by Grasso for second and kept the leader in his sights. With 10 laps remaining, Smith navigated through traffic at a blistering pace with Layton, Grasso, fourth-place starter Jason Shultz and 12th-place starter Davie Franek in tow. The leaders got caught in a web of lapped traffic with two laps to go which produced some intense moments. The second and final caution flag waved on lap 29 when Mallie Shuster made contact with the third turn guardrail. On the final restart, Smith led the chase to the checkered flag as a shuffle for the top five spots took place behind him. Smith’s margin of victory was just one second over Layton, Franek, Shultz, and ninth-place starter Ryan Kissinger. In the make up limited late model feature from May 5, polesitter Bryan Bernheisel, who already won two races in super late model competition at the track this year, pulled into the lead with second-place starter Todd Snook in pursuit. A lap later, third-place starter Jeremy Ohl and Snook see-sawed for the runner up position. With five laps remaining, fourth-place starter George Dixon Jr began to show some speed and took over the third position while Snook remained in striking distance of leader Bernheisel. The race was stopped briefly on lap 16 when Tim Krape and Matt Nailor got together on the backstretch. No drivers were injured. For the final restart, Bernheisel held command of the field while Snook and Dixon battled for the second spot. At the finish, Bernheisel was victorious over Snook, Dixon, Ohl, and Jim Yoder. In the regularly scheduled race for the limited late models, a multi-car melee unfolded in turn one on the start. Fortunately almost all of the drivers were able to restart the race. Polesitter Derick Garman raced into the lead when the green flag waved again with fifth-place starter George Dixon Jr. streaking into second. With five laps down, Garman led the field with Dixon in striking distance. Three laps later, Dixon used a lapped car to his advantage by diving to the bottom of the race track in turn four to take the lead away from Garman. The final five laps saw an intense race unfold at the front of the pack between Dixon, Garman, and 13th-place starter Steve Campbell. At the finish, Dixon took the checkered flag by 3.4 second over Garman, Campbell, ninth-place starter Bryan Bernheisel, and Snook. Shaun Lawton stormed into the lead from his fourth starting position in the pro stock feature. Lawton was chased by fifth-place starter Kyle Bachman and second-place starter Cory Long. On the second circuit, sixth-place starter Brandon Moser moved into the third position and started reeling in the leaders. By the halfway point, Lawton and Bachman were locked into a side-by-side battle for the lead and win. Bachman made numerous attempts to gain an edge over Lawton but Lawton maintained the momentum using the outside line. After drag racing around the half-mile oval for the entire second half of the race, Lawton took the checkers by just .41 of a second over Bachman, Moser, Long, and Noah Jensen. Bob Bussey drove into the lead from his third starting spot in the roadrunner race. Bussey first had to contend with polesitter Jake Jones until fourth-place starter Keith Bissinger and three-time winner and fifth-place starter Ryan Zook closed in on the leader. For most of the 12 lap race, Bussey had Bissinger and Zook racing in his shadow. Coming off turn four for the checkered flag, both Bissinger and Zook dropped to the bottom of the race track in a last-ditch effort to snag the win away from Bussey but fell just inches short. Bussey was victorious in a three-wide finish over Bissinger, Zook, Jones, and Tom Underwood.